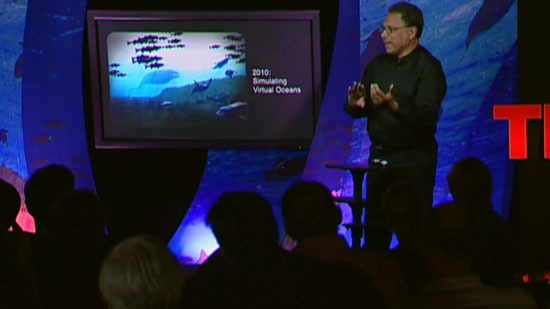 It’s available on Ted Talk the presentation from Dr. Pauly on the ocean’s shifting baseline. The key idea is that we need to stick to a baseline in order to develop a more reliable feeling on the changes that are happening. But what happens when we can’t see the baseline? In this case the use of simulations – films and images – can be of great help. 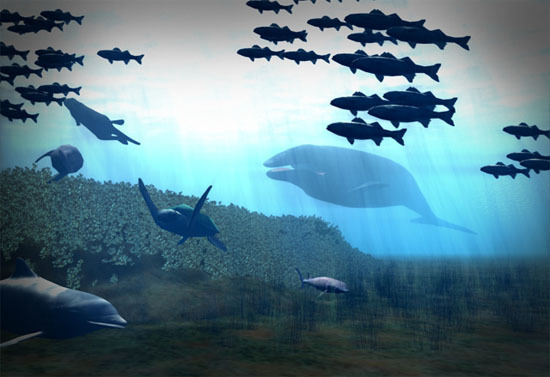 In the final slide of his presentation, Dr. Pauly showed an image to suggest a simulated ocean in 2010. You can see this at ~ 8:12. This is not one my favourite works, but it’s an important one. This image was made based on a still from the first animation made in Blender I worked on, back from early 2009: The Life in The Chesapeake Bay. It’s nice to look back and admire how many chances to improve my work I got. To work with science communication is a thrill, and to have this work recognized really makes my day. Note that this image is not being used only to illustrate a particular ocean scenario. The image is there to make a point. To reenforce the role of art in the understanding of our lives. A belated thank you for Villy Christensen, Sherman Lai and Mike Pan for the opportunity of doing the original project together. And for York University and the unexpected strike in late 2008 😉 God and his crooked lines, go figure.